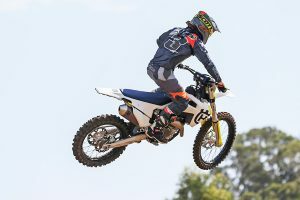 MotoOnline.com.au tests the 2018 KTM 450 EXC-F.
Last year the KTM 450 EXC-F won every round of the Australian Off-Road Championship (AORC) with Daniel Milner behind the bars, which has never been done by any other brand or rider in AORC history. 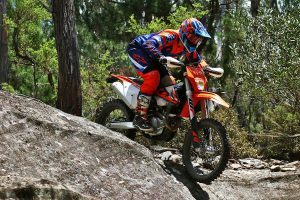 In 2017 KTM launched a new 450 EXC-F, redesigned from the ground up and it has had great success both in Australia and around the world. 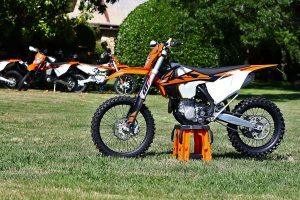 Much of the hype has been around the fuel-injected two-strokes from KTM in 2018, but that doesn’t mean we shouldn’t be excited about the 2018 KTM 450 EXC-F. Image: Alex Gobert (Foremost Media). 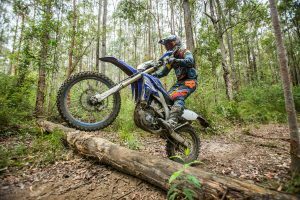 We were lucky enough to be invited to a private farm on the outskirts of the Belanglo State Forest, which boasted a tidy grass-track with plenty of ruts and off-camber corners, mixed together with a combination of short and long straights. Being on the edge of the forest, we were lucky enough to have the best of both worlds and following a short fire-trail ride up with KTM Australia’s Glenn Kearney and the farm owners, we were in the middle of the dense pine forest, full of rock ledges, undulating loamy soil with bike-length depressions and plenty of knee-height dirt mounds. You could spend hours ranging around the place with your mates and never get bored, so it was the perfect place to get some photos and seat time on the 450 EXC-F. 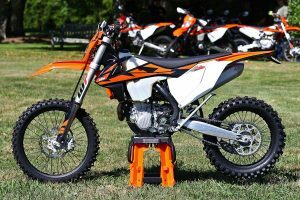 The 2018 KTM 450 EXC-F hasn’t received any major changes from the 2017 version, which was brand new from the ground up last year. 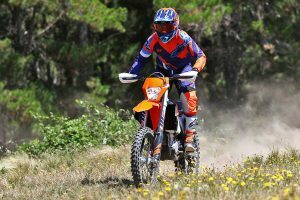 A few refinements around the bike have made small improvements to the already outstanding bike KTM had produced, as engineers focused mostly on the handling of the 2018 bikes with a minor few changes made elsewhere. 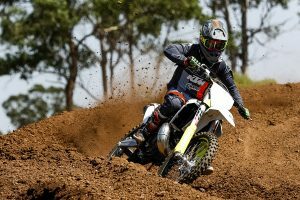 The refinements for the 2018 bike include revised settings in the WP XPlor 48 Fork. There are revised internal settings of the spring fork and PDS shock absorber, giving better front-end sensitivity and improved damping behaviour. In addition, a sealed hydro-stop provides great resistance to pushing through the entire 300mm of travel and bottoming out. WP has also used new stiffer fork outer tubes, which were drafted over from the SX-F forks. 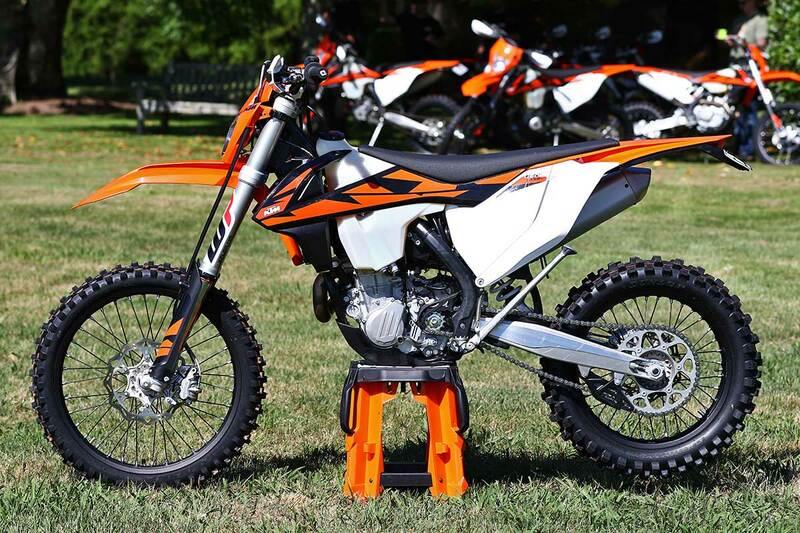 KTM’s also re-worked the radiator protectors to improve heat dissipation and create better air-flow, especially in muddy conditions. Continuing on with some of the features that carryover, let’s start at the front and work backwards. You’ll find an integrated braded speed sensor cable and front brake line, ODI Lock-on grips, 10mm lower seat height from 2016, No dirt foot-pegs and No dirt gear-shifter, Brembo front and rear brakes, Brembo hydraulic clutch, Neken handlebars, adjustable triple clamps (with four different positions), a Keihin engine management system with a EFI featuring a 42mm throttle body, six-speed gearbox, lightweight electric start and lithium-ion battery, an 8.5 litre translucent fuel tank, plus the air-box design eliminates incorrect mounting and provides better air-flow to the engine. Like the previous year, the 2018 KTM EXC-F is a powerhouse. The single over head cam engine is lighter than the previous generation and more powerful. Give it a fist-full and you know about it real quick! 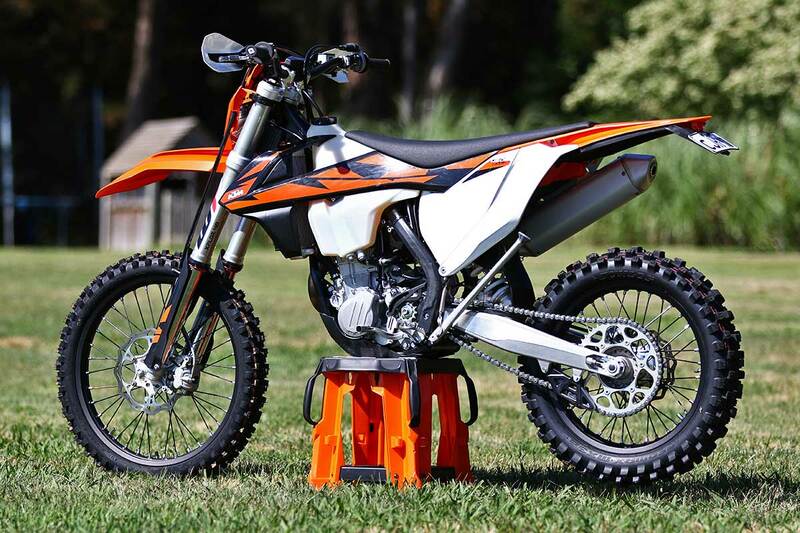 It’s more responsive with the ability to make it smooth as glass or aggressive as hell, but you will need to purchase a KTM traction control/mapping system. We didn’t get to use the TC function on the 2018, but we did on the 2017. The motor is managed by a state of the art Keihin engine management system, featuring a 42mm throttle body. The responsive characteristic of the 2018 model have a direct relation to this and the sensitive placement of the injector. 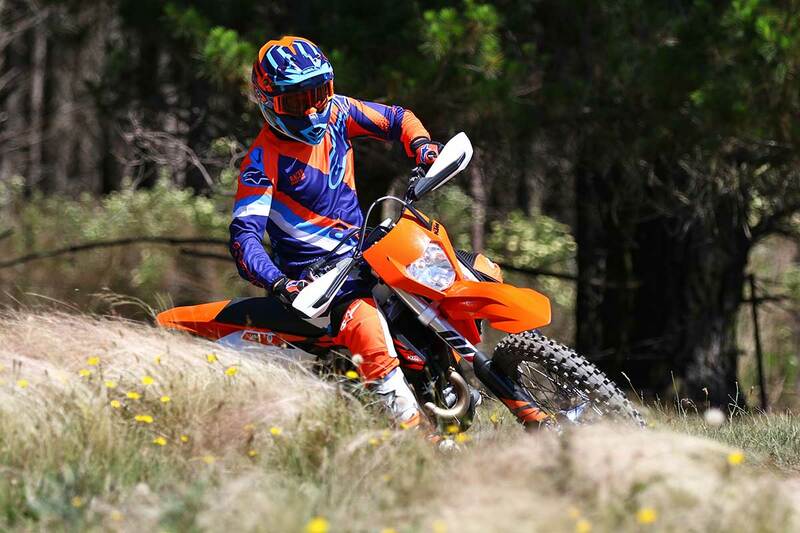 The six-speed gear-box is perfect for enduro riding, sitting nicely between gears in tight single-trail and you can keep clicking gears as you please on the longer straights. The moment you fire the engine to life using the electric start and lithium-ion battery (forget looking for a kick-starter, it isn’t there), the motor revs to the moon and, depending on the terrain, this could be a good or bad thing. The response down low is so good and the bike runs smoothly no matter what altitude or what temperature you are, at which is one of the best traits with an EFI bike developed as well as the KTM. Rev the bike and start clicking gears and you will have a hard time keeping a smile off of your face. The 2018 KTM 450 EXC-F chassis has been designed around the latest generation compact 450 motor, which has allowed for great gains. Not only in terms of handling, but in general it boasts an all-round slim and light feel. 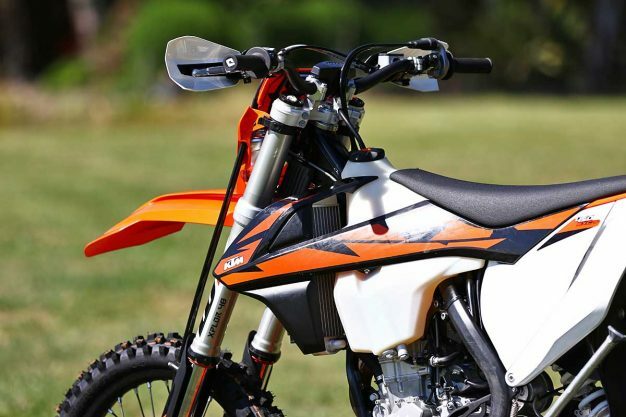 Starting from scratch, KTM has made the Chrome-molybdenum steel central-tube frame with better flex longitudinally and stiffer laterally, which has resulted in better handling and cornering that gives the bike more stability. Reducing the stiffness in the frame has helped with rider fatigue, allowing the frame to work better with its suspension package and absorbing the bumps. Lightweight aluminium engine head-stays work well to reduce vibration and help give more precise cornering. 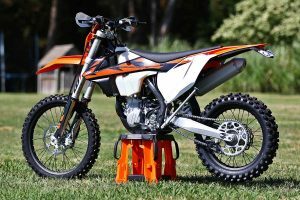 The frame itself is over one kilogram lighter than any other on the market, which is one of the major reasons the 2018 KTM 450 EXC-F is so agile. Siting on the bike, it’s quite slim and really does have a good feel about it, without being too small. Out on the trail the 450 EXC-F is extremely nimble between the trees and it’s right at home on the grass track – easy to change direction and it doesn’t feel like you have to really man-handle it to get it pointing in the right direction. The suspension – front and back – is well-balanced, plush and forgiving. There is no use having a bike with mountains of power and not being able to utilise it. 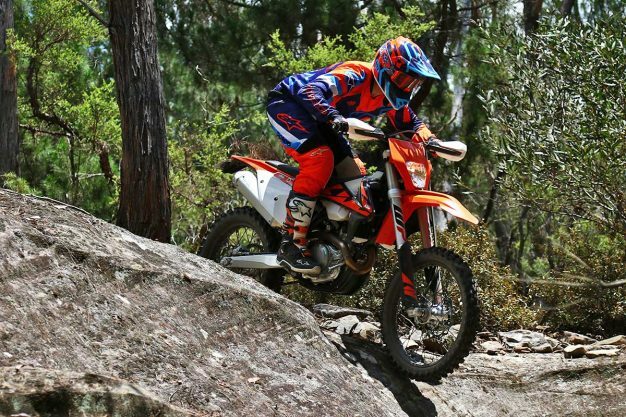 This is not the case with the 450 EXC-F, because besides the positive and confident cornering feel, the overall feeling in rough and rocky terrain is what you want. 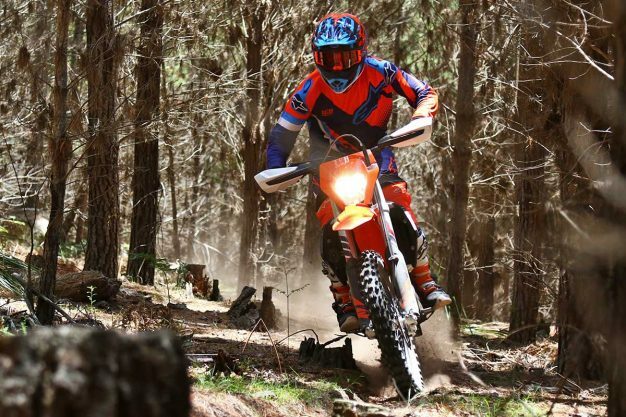 The bike doesn’t step out unexpectedly over the rough stuff and doesn’t feel like you are close to bottoming out over the square-edged bumps and rock ledges. The ability to change clicker settings out on the trail without the use of tools is perfect for anyone that is a suspension tinkerer. For me, I tend to get it somewhere close to comfortable, but I know there are people out there that are constantly searching for that magical setting. The aftermarket pre-load adjuster is another on-the-fly adjustment kit that sits on top of the fork tubes and it’s a handy option that many will be thankful for. The struggle is real when you try to find faults with the 2018 KTM 450 EXC-F. Its easy to see why it’s a class-leader, looking incredible at a standstill and becoming one of the most fun bikes you will throw your leg over. It boasts all the power you could ever need, doesn’t take much throttle to light up the back wheel and it really gets moving. Ergonomically the bike feels great, with a slim feel between the knees and it’s light as well. 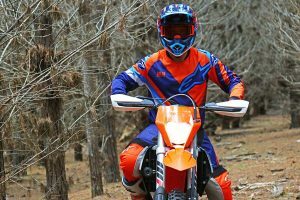 At 106kg, the 2018 model is the lightest the 450 EXC-F has ever been, so it changes direction with ease and feels right at home in the single-trail. It’s just as capable in the open as well, providing you the confidence required to keep twisting the throttle. The WP XPlor 48 fork and PDS rear suspension work a treat, evenly-matched front and rear with great response and a positive feel. There are only a few things that I personally would want different and I am clutching at straws to be honest… A bash guard is probably the first thing you would look at adding to the bike, then after that, as mentioned KTM does have an aftermarket traction control and mapping switch that allows you to tailor the power to the riding conditions, which would be great for wet weather or some steep mountain climbs. Last, but not least, is the fork pre-load adjuster, which allows you a choice of three settings without the use of tools. The 2018 450 EXC-F has a recommended retail price of $14,495 plus on road costs and is now available across the country.